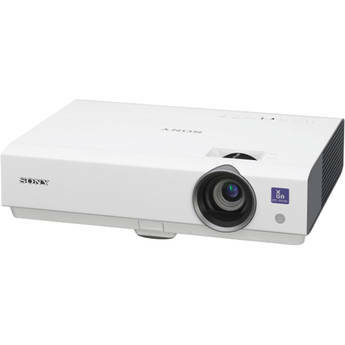 With a brightness of 3200 lumens, the VPL-DX142 XGA Multimedia Projector from Sony is optimized for small boardroom presentations and in-home use. It features an XGA (1024 x 768) native resolution, which has a 4:3 aspect ratio ideal for PowerPoint slide shows. Additionally, internal scaling allows the projector to work with a range of non-native formats, including SD, HD up to 1080p60, and computer signals up to 1600 x 1200 (UXGA). For connectivity to a range of devices, the VPL-DX142 features an HDMI input, a VGA input, and a composite video input. The VGA input doubles as a component input - a separately available adapter or cable from 3-RCA to VGA will be required. For audio, there is a shared 3.5mm mini jack input that can be used in conjunction with either composite or VGA inputs. To output audio, the projector features a mono 1W speaker for those times when no separate sound system is available. A remote, VGA cable, and carrying case are all included.